This stacking chair from OFM is traditional with a contemporary flair. The silver-vein finish and steel frame make this an elegant yet durable chair. 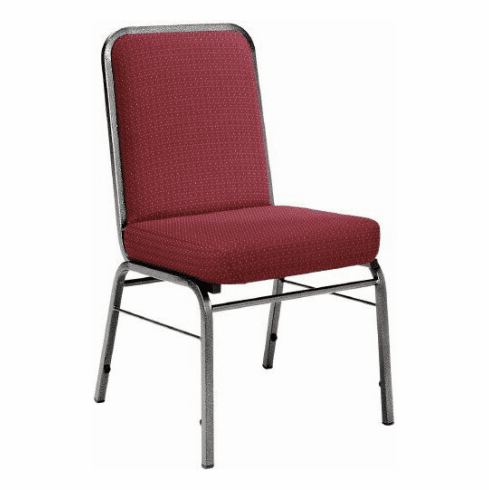 Features include a 16 gauge square tube silver vein steel frame, 3" thick hi-density foam on the seat upholstered in your choice of either teflon-coated, stain-resistant fabric or durable anti-microbial vinyl. 3/8" Thick plywood supports the backrest and 1/2" thick plywood supports the seat, fully assembled (no assembly required), built-in ganging brackets (links chairs into rows), stackable up to (12) high, 250 lbs. weight capacity. Optional rear mount book rack available for a minimal charge. This stacking chair meets or exceeds ANSI/BIFMA safety standards. Dimensions: Seat size: 19"W x 17"D. Back size: 18"W x 19.5"H. Seat height: 18.5". Overall height: 35.5". Limited lifetime warranty from OFM. This OFM stack chair normally ships within 1-2 business days from our NC or AZ warehouse.